With experience spanning almost two decades organizing some of the best trade fairs in Southeast Asia - from Singapore, Malaysia, Thailand, Vietnam to Indonesia, we believe the region has benefited and will benefit even more from our trade fairs as we bring global technologies and cutting edge innovations from some of the world’s biggest and renowned companies and visionaries closer to you in Asia. 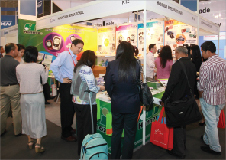 Since 1995, we at Messe Düsseldorf Asia have helped our clients expand and grow their business further in Southeast Asia and beyond, leveraging on the global expertise and relationships with our industry partners spanning the globe. Southeast Asia has tremendous prospects as a market and production centre for companies from all over the world. Our project teams will be on hand to assist you with your requirements from stand construction to freight forwarding, from advertising to marketing your presence at our trade shows. We endeavour to provide you with all the necessary information to help make your visit to our trade fairs as smooth as possible - from hotel booking to visa application. We are committed to provide up-to-date information on all our trade fairs to our valued media friends and facilitate any enquiries or interview requests you may have.